We are one of the leading wholesalers, suppliers and exporters of Endura Mass Powder. This Indian brand powder is highly demanded all across the globe. 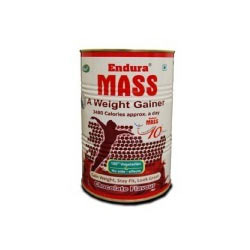 Endura mass is a high calorie gainer supplement, which consistently helps in increasing weight. This weight gaining powder can be consumed by both men and women.